January’s bakes where I also highlight what I recreated from the recipes linked up! January is often the month where so many of us steer clear of indulgent food like cakes and biscuits in an effort to re-balance the scales following the excesses of the festive season. Happily many of the bakes linked up last month did have a slightly healthier vibe to them, giving you that little treat and allowing you to feel as though you’re not missing out, whilst still being kind to your body. But if you are hankering after something more indulgent then there are certainly ideas and inspiration here for you to check out courtesy of my baking blogging friends who I must thank for continuing to support and link up to #BakingCrumbs. You guys are the best! If you’re curious to learn what we re-created in the Only Crumbs Remain kitchen from all of the bakes linked up this past month do keep reading and all will be revealed! get a great result every time! the crumble even more special! How enciting does Katie’s cake look with that thick, voluptuous shiny ganache slowly dripping down the sides of the coffee & walnut cake she made for her son’s birthday! strawberries and cocoa nibs. Definitely a celebration cake to try. good supermarkets), orange zest and pecans. What are you waiting for! they’re made with pulses – trust me, nobody ever knows that they’re there! going to search some out. I’ll let you pop over to the recipe to find out the ‘secret ingredient’ of our super yummy Vegan Peanut Butter & Dark Chocolate Blondies! You’re likely to have some in the cupboard already! I just love old fashioned recipes like Nico’s vegan Tea Loaf who blogs over at Yumsome. It’s such an incredibly easy loaf cake to make, and yet I imagine it to be packed with so much flavour. Helen, from Cooking with my Kids, shared these Banana and Chocolate Cupcakes. because there always has to be sprinkles? such an easy and tasty bake. Cat’s more indulgent Peanut Butter, Chocolate and Banana Bread sounds a definite winner to me. Being a huge fan of crumbles I have been very tempted by Shaheen’s recipe of Banana Muffins with Cocoa Crumble Topping! How good do they sound! kids involved in making them just like Louise did over at Cooking With Kids. for Spiced Apple Crumble Muffins. from Kate at Gluten Free Alchemist look! Do check out her recipe to find out how easy they are to make and see how amazing they look as the base for an English Breakfast stack! Of course, that breakfast option can easily be made vegetarian too. Don’t these look like The Best Bread Rolls? as the rolls are separated. Do check out Jenny’s recipe. These savoury muffins from Helen, with added cheese, tomatoes & spinach, sound perfect for an alternative lunch, eaten both warm or cold. I’m a huge fan of homemade pastry, just like Jess’s Sweet Shortcrust Pastry recipe, after all once it’s made the options are endless! It’s been so long since we last made a tea loaf (the plight of a food blogger is that recipes are rarely made time and time again!) 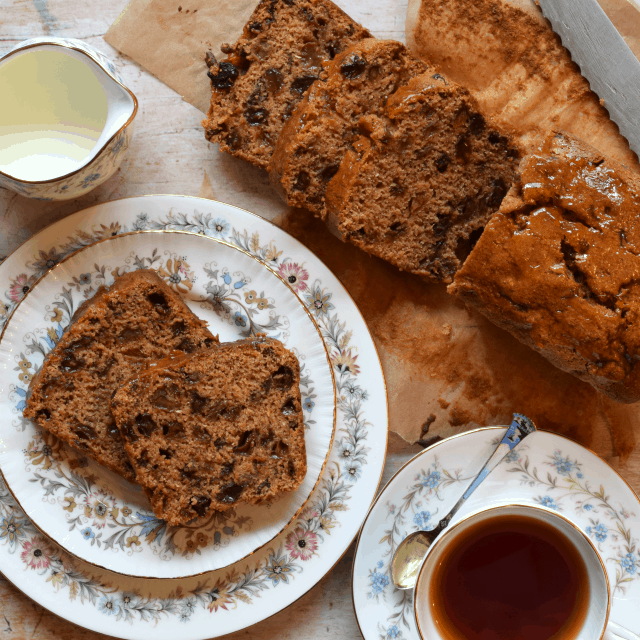 Plump fruits soaked in black tea made into a loaf cake which is lightly spiced is such a treat. And yet it is such an easy bake. So when Nico, from Yumsome, shared her English Tea Loaf recipe it was the perfect excuse to make one whilst trying out her recipe. But, in all honesty, the reason I chose to make her recipe was more than that. You see, this is a vegan Tea Loaf. And although I’ve shared a handful of plant based recipes this past month (because it was Veganuary!) I know I have a great deal to learn as far as vegan baking is concerned, particularly vegan cakes. Not only was Nico’s recipe seriously easy (and I mean seriously), it has also given me confidence to try other vegan recipes. And best of all we already had everything in the cupboard – so no fancy ingredients were needed. Win-win! And just how good does that tea loaf look with those plump fruits and the subtle aroma of spice (not that you can smell it – you’ll just have to trust me on that!). And yes, it tasted really great too – perfect with a pot of tea in the afternoon and after our evening meal. So, if you love tea loaf, are interested in vegan baking, or are entertaining a friend who is vegan or who follows an egg-free diet then I must encourage you to check out Nico’s recipe for Vegan Old Fashioned English Tea Loaf, as well as her blog Yumsome in general for some inspiring plant based recipes! Now onto February’s #BakingCrumbs Linky. You are also invited to join the Baking Crumbs pinterest group board! Just drop me a note and I’ll get you added to the board! Please note, by linking up you are giving me permission to use your photograph in the round up and on social media too. Hi Angela, Joining first time, following you on all social medias. This is my pleasure to found you on Cook once eat twice. Happy Valentine's day to you, thanks for hosting. By mistake two images of my link is shown, please remove one. You're welcome, it's lovely to have you link up Sadhna, I'm looking forward to reading about your Raspberry Breakfast Squares 🙂 Have deleted the extra link. So many amazing recipes, as ever I don't know how you manage to narrow it down and just pick one every month! I have to confess I rather wanted to make that Tea Loaf too but just havent had time. But you have convinced me to find time. Ive not been doing much baking so far this year after doing so much at the end of last year but I am beginning to miss it. I know just what you mean Jacqui, as much as I love to bake sometimes you can have too much of a good thing so it's nice to have a little break sometimes. Nico's tea loaf was so lovely and a great introduction to an easy vegan loaf cake. Hahaha, you may have mentioned it in passing Jo 🙂 Vegan bakes are so fascinating aren't they, I'm such a traditional baker with the use of eggs and so on. You're more than welcome Jess, everybody needs a good pastry recipe in their repertoir. Thankyou so much Corina 🙂 Nico's tea loaf was so lovely and a revelation for how easy a vegan version it was to make. Oooh those blackbean brownies were so yummy Corina, do let me know how you get on with them if you give them a go. So many delicious options! I'm obsessed with how good the lemon cheesecake looks! You and me both Kat – doesn't Jo's cheesecake look seriously magnificent!